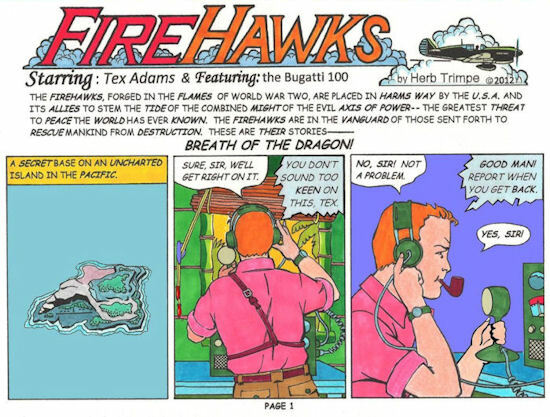 Starring Tex Adams and Featuring the Bugatti 100P. An exclusive limited edition comic strip, 24 pages made by famous comic artist Herb Trimpe. Follow-up to Firehawks from 2009. Also comprised some information on the Bugatti 100P airplane on the last page and the rear cover. Herb Trimpe is a long-time comic book artist, best known for his work on The Incredible Hulk and as the first artist to draw for publication the character Wolverine, who later became a breakout star of The X-Men. He has been drawing since 1967! 24 pages, A5 format, full-colour. Please indicate in the PayPal comments field if you would like me to sign your book!